NEWARK, N.J. (AP) - Amtrak and New Jersey's two U.S. senators think they have a way to add a rail link to New York City that will spread the cost around and prove more popular, among commuters and politicians alike, than the project Gov. Chris Christie killed last year. Sens. Frank Lautenberg and Robert Menendez and railroad officials on Monday proposed two tunnels under the Hudson River as a $13.5 billion alternative to the "Access to the Region's Core" plan, which Christie refused to approve because his state would have been on the hook for cost overruns. 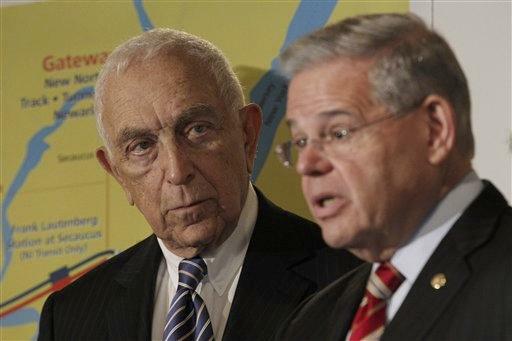 "New Jersey is facing a transportation crisis," Lautenberg said. "When the ARC tunnel was canceled, it was clear to me that we couldn't just throw up our hands and wait years to find another solution." Amtrak had been looking to build a second tunnel to increase capacity beyond one built in 1911 and to allow for a higher-speed line along the Northeast Corridor - but not for decades. When Christie killed the ARC tunnel in October, it began looking to speed up those plans. The main rail link between New York and New Jersey carries 62 trains a day; the new proposal would raise the number of daily trains to 92. Underscoring congestion problems, an Amtrak derailment Monday afternoon near a tunnel under the East River, on the other side of Manhattan, stymied the evening rush hour. The "Gateway Project" proposed Monday calls for the new Hudson River tunnel to open in 2020, two years later than the scrapped ARC tunnel. It would follow the same basic nine-mile path from Secaucus to New York that had been proposed for the other tunnel. The ARC tunnel would have ended north of New York's Penn Station, which serves Amtrak in addition to Long Island Rail Road and NJ Transit commuter trains. The proposed one would connect directly to new tracks at Penn Station, rather than end far beneath the Macy's store at West 34th Street. Unlike the ARC project, Amtrak would also have use of the tunnels, so it would not increase capacity as much for NJ Transit riders. But it may be a cheaper project for the state in the long run because of partnerships. Amtrak President and CEO Joe Boardman and Tony Coscia from the Amtrak Board of Directors joined Lautenberg and Menendez in announcing the proposal. Amtrak will ask the federal government for $50 million on preliminary engineering and design, said Boardman, who called the project "essential to the future growth and economic development of the entire Northeast region." Amtrak, a government-owned corporation whose board members are appointed by the president, said it would look for contributions from New Jersey, New York and government agencies to cover the cost of construction. Christie did not rule out making a future contribution to the project but said there is no money for a tunnel now. He also said any future contribution from the state would depend on a review of the project's merits. "If they asked me for a check today, then the answer is no," Christie said. Christie said the new proposal contains components he supports but the ARC tunnel plan lacked. For example, the new proposal has the tunnel ending at a renovated Penn Station, a project already under way, rather than under Macy's. He also said it contained mechanisms to control cost overruns and had the federal government taking the lead, instead of New Jersey. The proposal was heartening to New Yorkers, too. "The fact that even Amtrak is working to make this happen shows how important it is to the region's job growth and economic future," Sen. Charles Schumer of New York said in a statement. Christie killed the plans to build a second tunnel in late October. At an estimated $9 billion to $14 billion, it would have been the nation's biggest public works project - a title the new proposal will hold if it moves forward. Associated Press writer Angela Delli Santi in Trenton, N.J., contributed to this report.